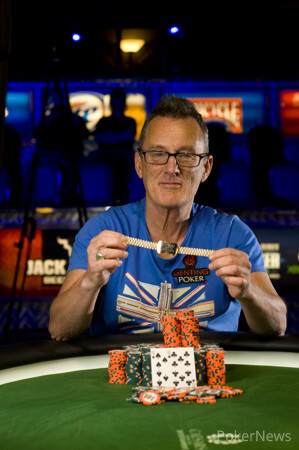 Barny Boatman is the latest big name to win a World Series of Poker bracelet after he took down Event #49 of the 2013 WSOP amid emotional scenes in the Amazon Room of the Rio All-Suite Hotel & Casino. The third and final day of the $1,500 No Limit Hold’em event started with 21 players, all of them in the money. Kevin MacPhee was the first player eliminated and he was followed to the cashier cage by a steady stream of eliminations. When Michael Quick’s pocket queens lost out to Paul DaSilva’s – DaSilva turned a flush – the final table was set. Roger Lussier was the first player eliminated at the final table; his could not come from behind to beat the dominating of Brian O’Donoghue. Seven hands later, Noah Sandler’s tournament came to an abrupt end, again at the hands of O’Donoghue. Sandler committed his stack with on a flop but ran into the of O’Donoghue. Sandler didn’t improve to a full house and the tournament was down to seven players. Seven became six on Hand 28 of the final table when DaSilva made an ill-timed move with on a flop while Boatman was sat with for a set of nines. DaSilva received no help from the turn or river and he crashed out in seventh place. Robin Ylitalo finished in sixth place after a blind-versus-blind confrontation with Boatman. Ylitalo shoved with and Boatman called with . Ylitalo caught a six on the flop, but the turn and river improved Boatman to a flush and sent Yliatlo home early than many would have expected. Boatman continued his spell of eliminating players when on Hand 58 Aditya Prasetyo moved all in from the cutoff with pocket tens and Boatman made an easy call from the big blind with a pair of queens. The ace-high board was void of drama and Prasetyo exited. Taras Kripps’ stack had started to dwindle and he made a move with . Unfortunately for Kripps, O’Donoughe woke up with and made the call. Kripps caught a king on the turn of the board, but the river improved O’Donoghue to a straight and resigned Kripps to a fourth place finish. Three-handed play lasted almost 30 hands and ended when Van Tran’s tournament did. Tran lost a huge pot that left him with less than four big blinds, but he started to make a comeback by winning four all-in hands in a row. On his fifth attempted he jammed with and O’Donoghue called with . A king on the flop and an ace on the river crushed Tran’s hand and the tournament went heads-up. Boatman and O’Donoghue started the one-on-one battle within one big blind of each other and neither player really ran away with proceedings. The match was less than epic, except in length (174 hands), but the scenes after Hand #276 of the final table were a remarkable sight. Hand #276 of the final table saw Boatman open to 240,000 and O’Donoghue three-bet to 550,000. Boatman made it 1.1 million and O’Donoughue moved all in. Boatman called with and was up against . A board reading sealed the deal for Boatman, who was mobbed by his rail, his brother Ross leading the celebrations that are sure to go on long into the night. That concludes our coverage of Event #49. 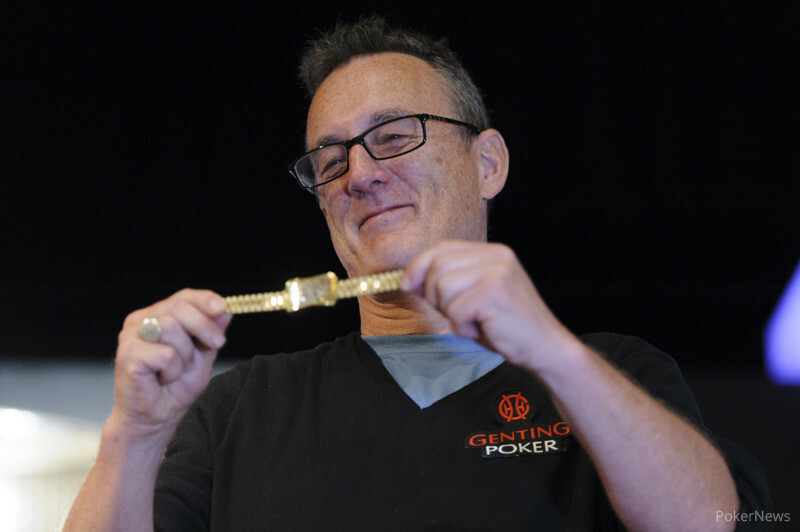 Be sure to keep your browsers locked to PokerNews.com for the rest of the 2013 WSOP and beyond. Hand 274: Brian O'Donoghue received a walk. Hand 275: O'Donoghue opened to 240,000 and Barny Boatman folded. Hand 276: Boatman opened to 240,000 and O'Donoghue three-bet to 550,000. 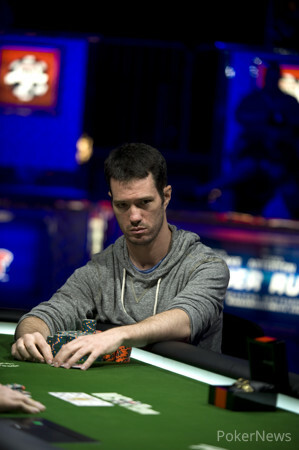 Boatman responded with a four-bet to 1.1 million then called when O'Donoghue moved all-in. The crowd rose to their feet as the dealer put the flop onto the felt, improving Boatman to a set but also giving O'Donoghue outs to a straight. "Deuce! Deuce" Boatman's rail pleaded. The turn was the and the river the . With that Boatman had won his first bracelet and his enormous rail's cheers blew the roof off the Rio! Boatman's brother Ross embraced Barny before the British rail chanted, "There's only one Barny Boatman" while Boatman strutted his stuff in front of them. Amazing scenes, indeed. Hand 268: Brian O'Donoghue received a walk. Hand 269: O'Donoughue limped and Barny Boatman checked. The players then checked down the board, Boatman showing an ace to win the pot. Hand 270: O'Donoughue received a walk. Hand 271: Boatman received a walk. Hand 272: Boatman raised to 240,000 and folded to a 550,000 three-bet. Hand 273: Boatman received a walk. Hand 263: Brian O'Donoghue raised to 200,000 and Barny Boatman called. Boatman check-folded to a 200,000 bet on a flop. Hand 264: Boatman raised to 200,000 and folded to a 450,000 three-bet from O'Donoghue. Hand 265: O'Donoghue raised to 200,000 and it won the pot. Hand 266: Boatman raised to 200,000 and O'Donoghue folded. Hand 267: O'Donoghue opened and Boatman folded. Hand 257: Brian O'Donoghue opened, Barny Boatman folded and the heads-up duo continue their quest for the longest heads-up battle in history. Hand 258: Boatman opened to 200,000 and O'Donoghue folded. Hand 259: O'Donoghue opened and Boatman, you guessed it, folded. Hand 261: O'Donoghue opened to 200,000 and Boatman folded. Hand 262: O'Donoghue raised to 200,000 and Boatman mucked. Hand 251: Barny Boatman received a walk. Hand 252: Boatman raised to 200,000 and Brian O'Donoghue folded. Hand 253: Boatman received a walk. Hand 254: Boatman raised to 200,000 and there was no further action. Hand 255: O'Donoghue opened to 200,000 and Boatman folded. Hand 256: Boatman made it 200,000 to play but instantly folded when O'Donoghue three-bet to 500,00. Hand 245: Barny Boatman received a walk. Hand 246: Brian O'Donoghue received a walk. Hand 247: Boatman received a walk. Hand 248: Boatman raised to 200,000 and O'Donoghue called. 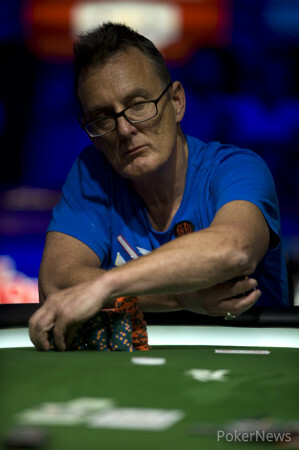 O'Donoghue checked then folded to a 100,000 bet on a flop. Hand 249: Boatman received a walk. Hand 250: Boatman raised to 200,000 and was called. The flop was checked. O'Donoghue bet 275,000 on the turn and Boatman called. Both players checked the and Boatman won with his . Hand 239: Barny Boatman received a walk. Hand 240: Boatman raised to 200,000 and Brian O'Donoghue called. The flop was checked by both players. The was bet to the tune of 275,000 chips by O'Donoghue and Boatman folded. Hand 241: A raise to 200,000 by O'Donoghue was met with a fold from Boatman. Hand 242: Boatman raised to 200,000 and O'Donoghue sent his cards back to the dealer. Hand 243: O'Donoghue raised to 200,000 and Boatman folded. Hand 244: Boatman raised to 200,000 and quickly folded when O'Donoghue raised to 500,000. Hand 233: Barny Boatman received a walk. Hand 234: Boatman raised to 200,000 and Brian O'Donoghue three-bet to 500,000. Boatman folded and the dealer started shuffling the deck for the next hand. Hand 235: Boatman received a walk. Hand 236: Boatman raised to 200,000 and again there was no post flop action. Hand 237: O'Donoghue bet 200,000 and Boatman mucked. Hand 238: Boatman raised to 200,000 and won the pot uncontested.